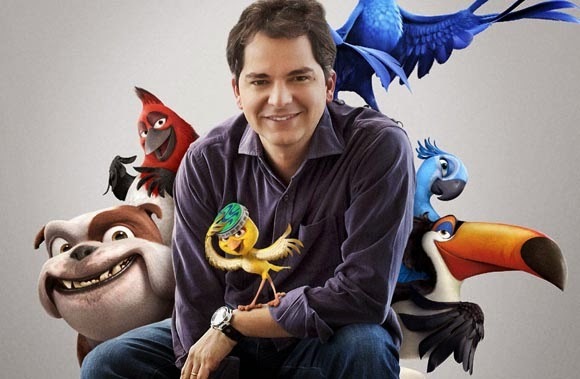 "Rio" was one of the big animated feature film hits of 2011. Its tale of colorful birdes engaging in adventures south of the border captured the hearts of filmgoers and was propitiously timed, coming at the end of winter and playing on the desire of viewers to welcome in summer. 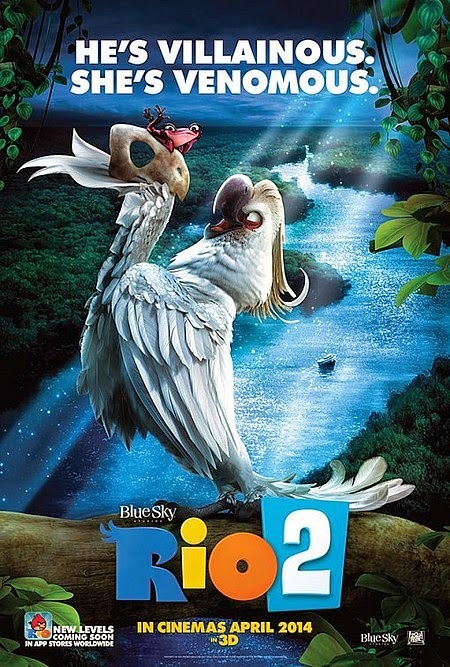 The same formula works to perfection for the sequel, "Rio 2" (2014), again directed by Carlos Saldanha, which similarly was released at the end of an even tougher winter for much of the US. "Rio 2" continues the adventures of Jewel and Blu and their colorful flying friends and allows us to return to the warm beaches and colorful forest of South America. It is several years after the original story, and Blu and Jewel have several children: Carla, Bia and Tiago. Linda Gunderson, who owns the pet store that Blu left, has gone to the Amazon with husband Tulio. There, Linda and Tulio spot a rare Spix Macaw, which is critically endangered and which some had thought extinct. Jewel pressures Blu to go to the Amazon to help her former owner Linda, and friends Rafael, Nico (Jamie Foxx) and Pedro (Will.I.Am) tag along. Blu, realizing the hazards, thoughtfully brings along supplies, including a GPS device that Jewel turns up her nose at. There is illegal logging going on near where Linda and Tulios saw the rare bird, and the loggers don't want a bunch of environmentalists around causing problems and devise plans to get rid of them. Nigel the Cockatoo from the first "Rio" film survived his fall from the plane at the end of that film and is working as a fortune teller/con man because he was injured. Nigel spots Blu and the others flying overhead and vows to get his revenge along with sidekicks Charlie the Anteater and Gabi the frog. 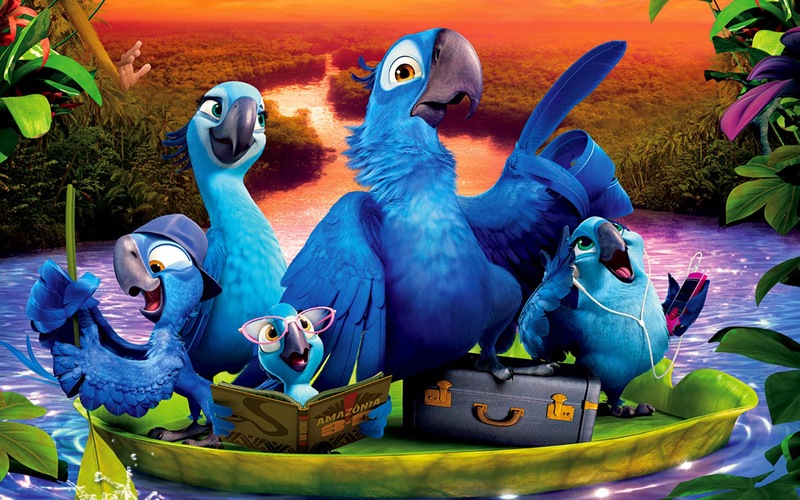 Blu and company hop a boat to the jungle and stumble upon a flock of blue macaws hiding in their own hidden colony. Jewel's long-lost father, Eduardo, is living there, along with sister Mimi and Jewel's childhood friend Roberto. The flock hates all things human and Eduardo in particular thinks that Blu is a traitor for liking them. The loggers, meanwhile, capture Linda and Tulio. Blu and Eduardo attempt to bond, but Eduardo's attempts to toughen up Blu and make him more like the flock fail. Nigel disguises himself as a bird named Bob and auditions for Carnival. Blu goes out to get a precious gift for Jewel, but while there he inadvertently invades the territory of the Scarlet Macaws, fierce enemies of the Spix Macaws and who are led by tough Felipe. Blu accidentally hits Felipe with a twig, which causes a war to break out between the opposing camps that resembles a soccer match. Blu loses the game, which further alienates him from Eduardo. Blu, now on the outs, goes with Roberto to inspect Linda's and Tulio's camp. They find a broken CB radio and almost get run over by a tractor, but find Linda and Tulio. Blu saves the couple while Roberto goes to warn the flock about what is happening. The macaws, led by Blu, decide to defend their homes against the hostile loggers, and the Red Scarlet Macaws help. The loggers, trying to avoid defeat, set dynamite to blow up the trees, but Blu foils their plan. Nigel then shows up and attacks Blu, and Gabi joins in. However, Gabi's attempt to shoot Blu with a poison quill backfires when the quill hits Nigel instead. Seeing Nigel, who she secretly likes, appear to die from the quill causes Gabi to try to kill herself as well. Bia, however, notices that the quill wasn't poisonous at all, and she prevents Nigel from arising from seeming death and getting at Blu. The leader of the loggers, realizing he is defeated, tries to run away but is eaten by a boa constrictor. 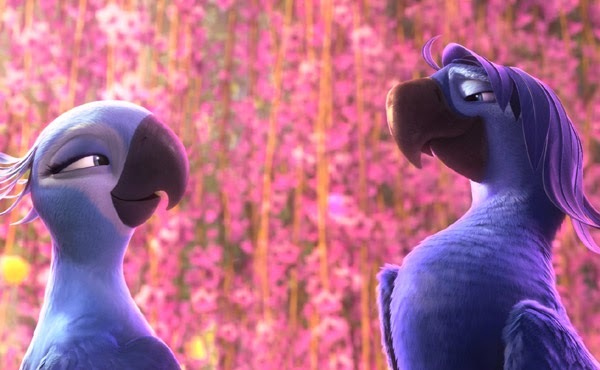 Linda and Tulio, free, now resolve to protect the Blue Macaw flock. Blu and Jewel remain with the flock, while Tulio takes Nigel and Gabi back to Rio, and everybody is reunited and happy in the rainforest. 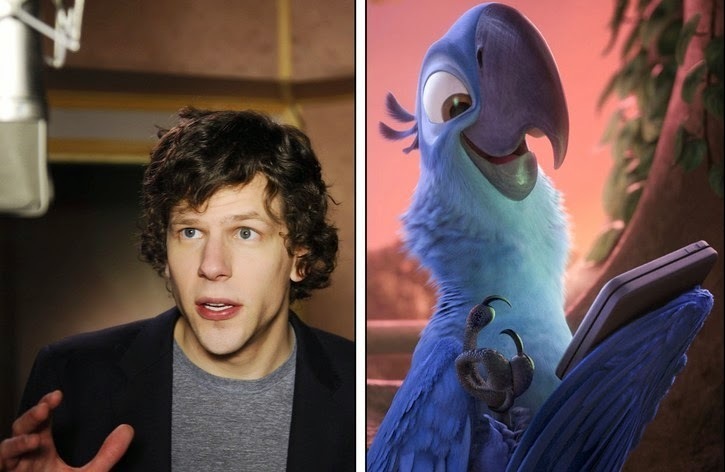 The cast of "Rio 2" is substantially unchanged from the first film, with Jesse Eisenberg and Anne Hathaway engaging as the fussy couple Blu and Jewel. In addition, congenial newcomers Andy Garcia, Kristin Chenoweth, Bruno Mars and Rita Moreno join the cast as Eduardo, Gabi, Roberto and Mimi to add some spice. Rodrigo Santoro, who is busy between the "Rio" films and his role of Persian Emperor Xerxes in "300" and its sequel, is an under-used delight as Tulio. Evil Cockatoo Nigel, as in the first film, is a scene-stealer as voiced by Jemaine Clement. The key to the whole production, though, is director Saldanha, for whom the "Rio" film series clearly is a labor of love and a triumph. The soundtrack by John Powell on Atlantic Records is fun, with songs by stars Bruno Mars, Janelle Monae, Rita Moreno, Andy Garcia and the other cast members. It is the animation, though, that stuns. 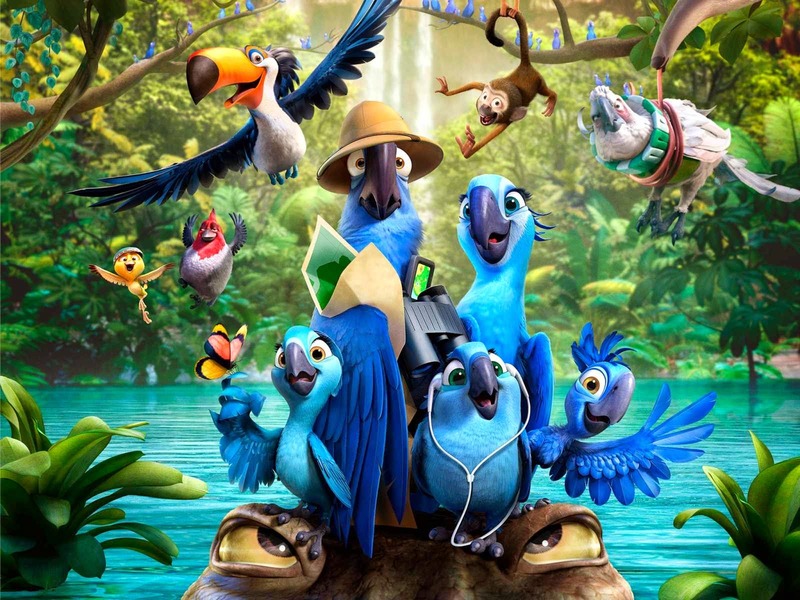 The 3D CG animation by Blue Sky Studios on behalf of 20th Century Fox Animation is spectactular once again, bringing forth the vibrant colors of the rainforest and its creatures. Films like this are terrific in building support for the environment and exposing people to the wonders of nature. Unfortunately, that creates the impression that if you don't think that "Rio 2" is super-wonderful that you are either against South America or the environment, which is not the case. The plot by screenwriters Don Rhymer, Carlos Kotkin, Jenny Bicks and Yoni Brenner from a story by Carlos Saldanha is not only busy, it also is a bit fanciful and works just a bit too hard at bringing in as many tropes of South America as it can shoehorn in (the football game in particular is a bit silly). The bad guys are really, really bad and may as well wear black hats, while we get the standard misunderstood hero thing from Blu, who as usual has to overcome as much blowback from his friends as from the enemy. It's a sequel done in large part by rote. 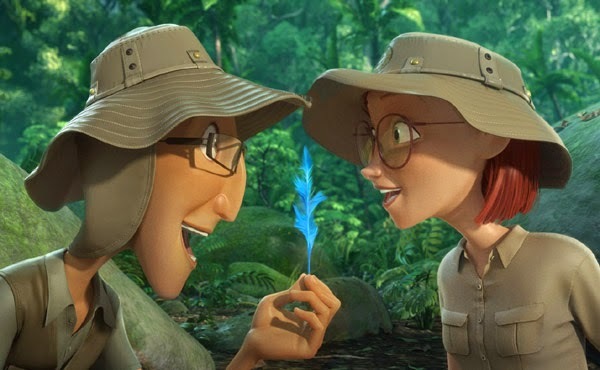 There is so much action in "Rio 2" that it doesn't give too many opportunities to let your mind wander as you might want it to if you actually were to visit such natural splendor, which is both good and bad. There's no lying back on the beach and enjoying the sun in "Rio 2." Even the terrific musical numbers which are the film's highlight have extensive choreography that sometimes make you wish they would just stand there and sing their songs already. Younger viewers love the frenetic pace of "Rio 2," while the incessant parade of colors may be a bit off-putting to some older viewers. In summary, great visuals, maybe a little too great, with a rambling plot that isn't exactly a classic but gets the job done while being a tad heavy-handed on the pc front. Anne Hathaway at the Miami premiere of "Rio 2"
"Rio 2" is a worth successor to "Rio" and is another success for Blue Sky and director Saldanha. It has the usual pluses and minuses of sequels. If you liked the first film, you'll no doubt like this one as well, but it won't add much to what you've already seen in "Rio." 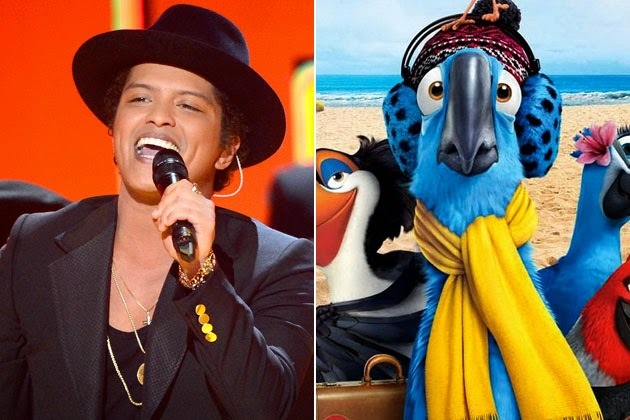 Below are the trailers for "Rio 2."